A couple of years ago, Josiah Brooks (Jazza) released an app called Arty Games that generates random ideas for illustrators. I’ve used it for a few drawings in the past, which was a great way to battle creative block when I wanted to draw something, but couldn’t come up with any ideas. I recently decided to do a daily art challenge that incorporates a new idea each day from the app using Procreate on the iPad Pro. Each day I drew a randomly generated character idea and then finally placed them in an environment as dictated from Arty Games. Day 1: A grumpy goblin smoking a joint with a robot arm. Day 2: A jolly elf who has had too much coffee. Day 3: A murderous kindergartener with glasses who is afraid of their own shadow. Day 4: An evil robot from the future who can control time and is wearing large gloves. Day 5: A porcupine who is stitched up like Frankenstein’s monster who is holding a key. Day 6: A celestial cow who needs batteries to survive and is wearing leather shoes. Day 7: A sparkly dragon who is wearing an oversized shirt. Day 8: A pine tree forest filled with tombstones. Day 9: Coloring the characters. Overall, I’m pleased with how it turned out and I’m glad I was able to finish it before I hand over my iPad Pro to get the screen replaced. The corner of the screen has a dead spot when using the Apple Pencil, which is incredibly annoying, so hopefully I’ll be back to drawing soon. It’s been quite awhile since I last released a game for myself. The other night, I decided I would try to push out a game in 3 hours or less. The result is Maddie Bear in Space. It’s available for iPhone, iPad, Kindle Fire, Android and Android TV and requires a simple touch or button tap interface. 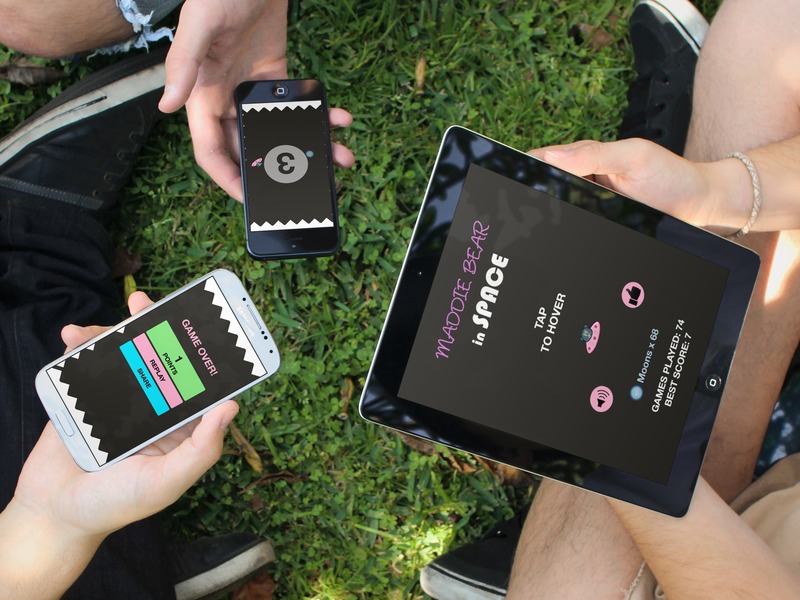 You collect as many moons as you can and avoid the spikes to gain a high score. I’m very pleased to announce that my new video course, Create a Space Pinball Game in Construct 2, is now live on Udemy! It’s priced at $59, but I want to offer it to my loyal blog followers at a special discounted price of $20. The first 50 readers to use promo code BLOGFOLLOWERS or click this link will save $39 off the normal price. Thank you for continuing to read my blog and have fun making the pinball game! Maddie Bear’s Birthday iPad App: FREE! This is the month of my daughter Maddie’s birthday. To celebrate, I’m giving away Maddie Bear’s Birthday for iPad for free for a limited time. Some of you may remember the days when the birthday kid in school would bring in cupcakes to celebrate their birthday. This is Maddie’s version of that, everyone gets a free iPad app. If you could leave a review as a birthday gift to her, it would be very appreciated. I’m very pleased to announce that Maddie Bear’s Snack Time has just been approved for the Amazon Fire TV! In case you’re not aware of the Fire TV, it’s Amazon’s new plug-and-play media box for your television. It gives you access to Amazon Prime movies, Netflix, and even games. It’s very similar to Apple TV, but with its own games and gaming controller. 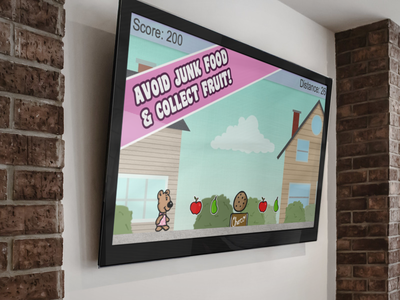 This means you can now play Maddie Bear’s Snack Time on your TV with the Fire TV remote instead of being limited to a touchscreen tablet or smartphone. For the iOS, Android, Kindle Fire, and Nook Tablet versions of Maddie Bear’s Snack Time or any of my other apps, check out www.GPAnimations.com. I’m happy to announce that my latest mobile app game, “Maddie Bear’s Snack Time” is now released for iPhone, iPad, Android, Nook Tablets and Amazon Kindle Fire Tablets. 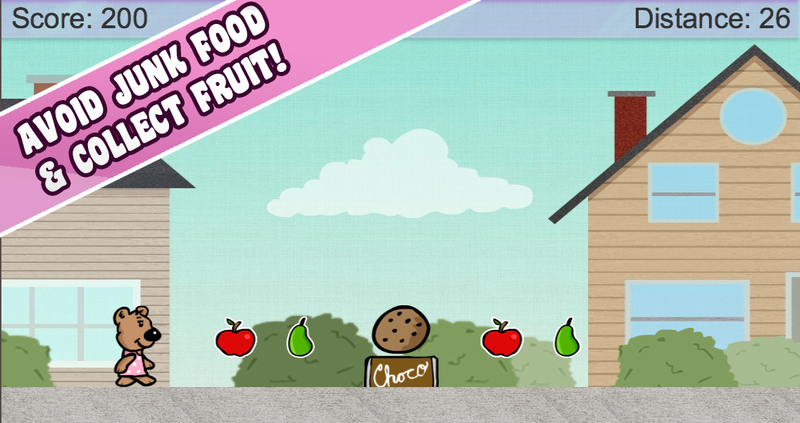 Based off of the Maddie Bear book series, Maddie Bear’s Snack Time is a game where Maddie Bear tries to eat as many pieces of fruit as possible while avoiding all of the junk food. 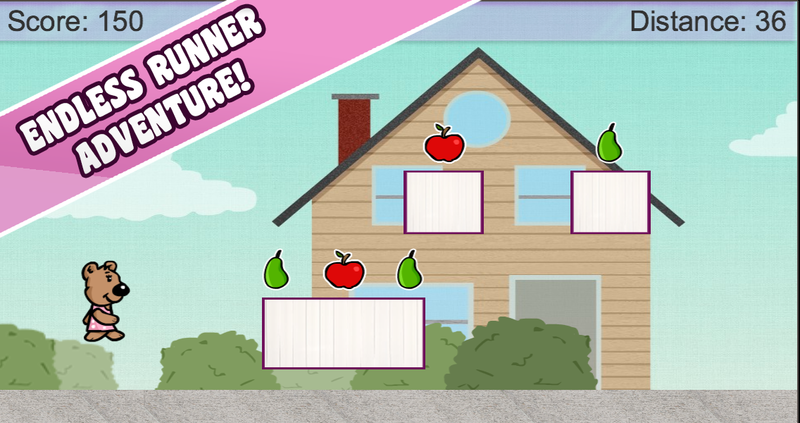 It’s an endless runner-style game that is very easy for young children to pick up. Maddie Bear’s Birthday: iPad App Giveaway! You can either give the promo code to a friend, or use it to have both the interactive and paperback version for you and your kids. Maddie Bear’s Birthday: iPad App Coming Soon! I’m happy to announce that I just uploaded version 1.0 of the Maddie Bear’s Birthday app to Apple for approval. Approval process is usually about two weeks, so hopefully soon you’ll be able to pick up your copy! The iPad version differs from the paperback in that it contains a spot the difference mini game, animations, music and sound effects. Sometimes it’s nice to have a version with all of the bells and whistles and sometimes it’s nice to have a regular book, so that’s why I wanted to create both versions. You can still pick up a copy of the autographed book bundle from www.MaddieBearBooks.com!